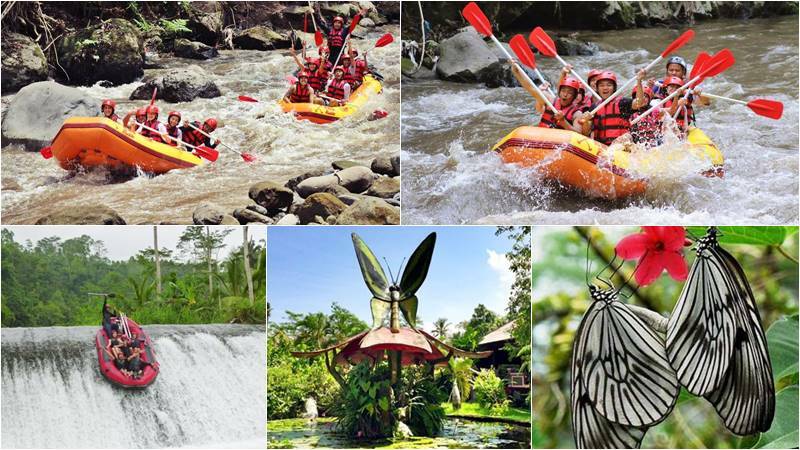 Bali Rafting + Butterfly Park Tour is an awesome Bali Rafting Tour Package where you can enjoy Bali whitewater rafting at Ayung River or Telaga Waja River, then combine with visiting Bali Butterfly Park in Kemenuh, welcoming you warmly and honorably with great pleasure, to enjoy the unique pleasure of seeing the most beautiful, brightly colored flying insects (butterflies) in an exotic landscape of tropical blossom. Your Bali Ayung rafting tour begins with morning pickup by our driver with private air-conditioned car from your hotel in Bali and drive through the countryside and arrive at village of Payangan, Ubud Bali. For safety standard, all participants are equipped with rafting equipment including lifejacket and helmet. It is time for you to experience a truly unique and memorable epic journey thru winding gorge, luscious jungles, and wild life in its natural homes. Paddle through astonishing waterfalls for unparalleled river fun. Our trained professional guide with internationally accepted equipment will guide you through about 12 km of exciting grades II and III rafting. Your safety is our highest priority always on 2 hours of Ayung river rafting fun trip. Paddling over hanging trees and vines create a thrilling beginner-class rafting course. Clear water with numerous hair pin curves and great challenging rapids, along deeply carved valley with towering waterfalls, lush jungle, rice terraces will fascinate you until the end of activity. At the end of the trip, we challenge you to plunge into 4 meter of waterfall at Bajing dam. Towel and shower are available at our finish points. With great pleasure we welcome you to Kemenuh Butterfly Park with a special joy of watching the most beautiful, brightly – colored flying insects (butterflies) in an exotic tropical tropical blossom. Butterfly (Lepidoptera) is regarded as the most remarkable flying insect. Most people agree that butterfly can make our planet a more colorful place and make our eyes and souls more comfortable when we look at it. In this spot, three aspects can be discovered, namely conservation, education and attraction, to protect this remarkable creature. KEMENUH BUTTERFLY PARK is dedicated to protecting this remarkable creature. The park’s background is a spectacular rice field and a magnificent tropical environment. As the home of the adult butterflies (imago), the park is designed to be based on the need of insects. The plants are dominated by tropical beautiful flowers as food for adult butterflies (imago). The beauty of the park is enriched by splashing waterfall and a fish-filled pool. The park collects various colorful butterflies. You can see and watch them flying and flying. Sometimes some butterflies rest on the plants and it gives you a chance to take a picture of them. On the way out, you can go to a pupa/chrysalis room. Hundreds of pupa / chrysalis can be seen hanging inside the room. If you are lucky you can see how the adult butterflies (imago) come out of the pupa / chrysalis. Moreover, releasing adult butterflies (imagos) from inside the room to the park is a nature experience for you that is absolutely unforgettable.